Mushara Bush Camp offers guests an authentic African bush experience when they stay here. 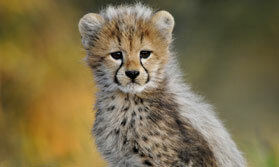 This down-to-earth camp provides accommodation in 16 custom made, traditional safari tents. The tents are constructed from canvas, wood and limestone. They are spacious and airy with floor to ceiling windows and a large private veranda with seating, an ideal place to relax and enjoy the sounds of nature. Even the bathroom hss large windows and views of the surrounding bush can be enjoyed from your shower. The tents are kept cool by the stone walls and brushed cement floors, even in the midday sun, they remain cool. The addition of a coffee station, small safety box, mozzie nets, hair dryer and a floor fan ensure the little touches are catered for, your tent even has electric sockets for battery charging. Pathways, illuminated at night, link the accommodation to the stylish main area. This houses a restaurant, bar and lounge under a large thatch roof. The sides are open to allow cool breezes to circulate as you sit and relax amid the contemproary decor, or enjoy a delicious meal. Breakfast is a buffet affair with both hot and cold food on offer. Light lunches and dinner are served on the veranda, to the accompaniment of the sounds of the bush. Enjoy a dip in the pool, or simply relax on one of the loungers then finish off your day with a coffee or liqueur by the open camp fire where you can swap stories with fellow guests. Activities at Mushara Bush Camp centre around morning and late afternoon game drives in Etosha, guided walks are also offered in the area surrounding the lodge. Guests can self-drive into Etosha from here, the Von Lindequist gate in eastern Etosha is the nearest, less than 10km from the camp. Open: Mushara Bush Camp is open year round. Location: Less than 10km outside Etosha. The Von Lindequist gate in eastern Etosha is the nearest entrance to the park. Rooms: There are 16 traditional safari tents, four have a sofa bed which can accommodate 2 children. The rooms have large windows, even the bathrooms have great veiws. Tents have fans, small safe, charging sockets, mozzie nets and outdoor seating on the veranda. 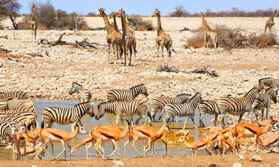 Activities: Game drives are offered in Etosha, both morning and late afternoon. Guided walks in the area surrounding the lodge and also lunchtime picnics are offfered. Facilities: The main area has open sides to allow you to enjoy the surroundings. There is a lounge area, dining area and bar. The main area also has a refreshing pool for a delightful afternoon dip and a fire-pit for swapping stories before retiring. Children: Children of all ages are welcome at Mushara Bush Camp. Communication: There is WiFi available at the camp. "Main building is lovely. " "Lovely. Another treat in the bush. We enjoyed the tented accommodation, the Lapa was beautifully set-up, the staff were charming and helpful and the dining was a pleasure. Nice pool, good towels & plenty of shade." "We loved the tented rooms, the main building was beautiful, the staff were the best we encountered and quite charming, and the food was excellent (but beware the chef who eats the guest's eland steak! Joke of our trip, taken in good faith all round.)"